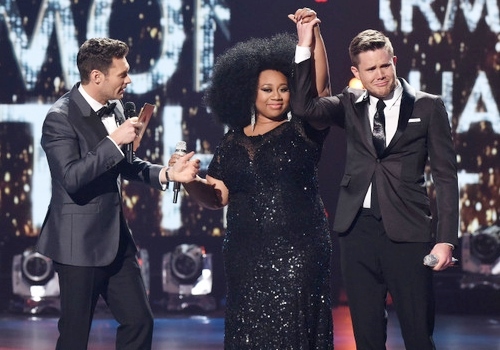 It’s a sad day for American Idol fans (and for the bank accounts of the judges! ), after 15 seasons, the show will come to an end! Fox has renewed the show for one more season, which will air next January with Jennifer Lopez, Harry Connick Jr. and Keith Urban at the judges’ table for the farewell. The final season will be a regular competition like always, but will include plenty of surprises and tributes to the seasons past. I feel a lot of cameos and surprise guest appearances coming on! After weeks and weeks and weeks of auditions, the American Idol top 12 were announced last night. The top 10 – based on votes – were Maddie Walker, Jax, Tyanna Jones, Sarina Joi-Crowe, and Joey Cook for the girls and Qaasim Middleton, Nick Fradiani, Daniel Seavey, Clark Beckham, and Rayvon Owen for the guys. The wild cards went to Adanna Duru and Quentin Alexander. I was under the impression that I was the only person in America still watching American Idol, but, um, apparently not. There is no way in hell Daniel, who’s fresh from his mother’s womb, and Qaasim, who’s a seizure waiting to happen, would have made it to the top 24, let alone the top 10, based on my votes. I’m shocked Daniel and Qaasim were voted in over Quentin Alexander and Mark Andrew. Thankfully, the judges saved Quentin (and the season for me) with a wild card, but I mourn the loss of Mark. This competition needs Quentin.